This is where ruggedized cases are a blessing, but they come with their share of downsides, mainly being that they are almost always very bulky, cumbersome, and just generally spoil the iPhone’s good looks. 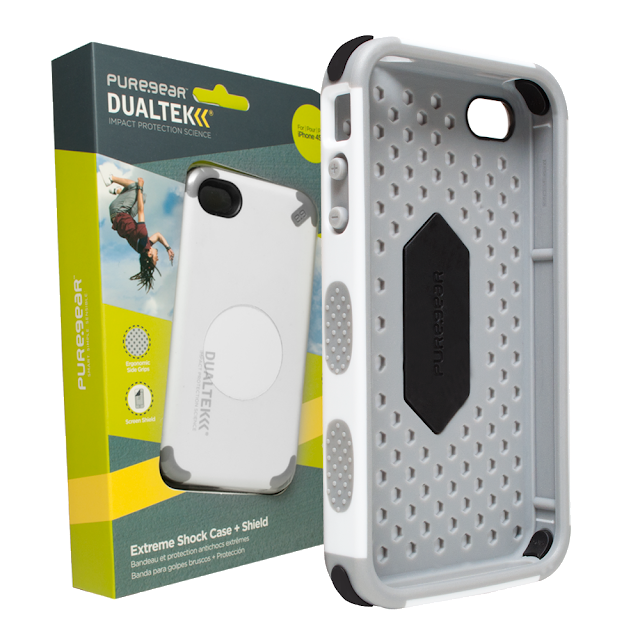 Well, PureGear is looking to change this perception of rugged, extreme protection cases with their latest release, the DualTek Extreme Shock case for iPhone 4/4S. 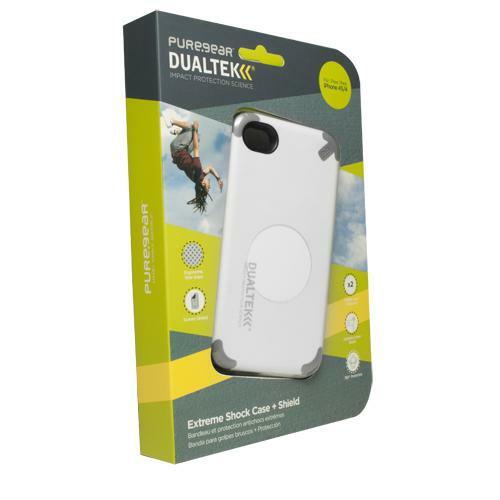 Inside the packaging you’ll find the DualTek case, and a front screen shield to give you 360 degree protection for your iPhone. 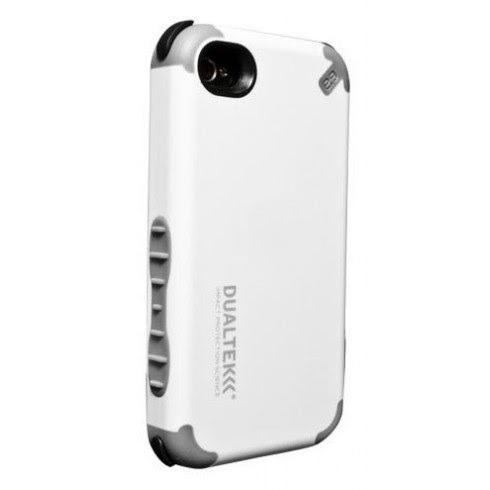 When you have the DualTek in your hand, you’ll probably immediately notice that it’s a very, very rigid case. The DualTek is a multi-layer, co-molded construction case with a harder outside shell fused to a soft inner rubber-like core. As with other cases of this hard/soft dual layer construction style, to install the case you simply press your iPhone in from the front of the case until it snaps firmly in place. Once installed, you can really see how this case was designed with maximum shock absorption in mind. Inside the DualTek, your iPhone is actually suspended between the 4 black shock-absorbing 3M E.A.R. impact inserts located at each corner. These impact barriers actually protrude through the corners of the case, and are the case’s primary protection mechanism against corner drops. Along with these impact zones, the inner gray layer is a soft rubber/TPU material to further aid in impact protection. On the outside, you’ll find the hard, matte finish polycarbonate outer layer that adds to the impact protection of the DualTek. This is one of the firmest outer layers of a case this type that I’ve ever seen. PureGear’s decision to go with a matte finish for the outer layer is a good one. It should show much less wear and scratches over time, as opposed to a glossy finish. Along the left and right sides of the case you’ll find ergonomic palm and finger grips formed by allowing areas of the softer rubber layer to protrude through to the outside. These grip areas are a really nice touch. Even though the case has a matte finish on the exterior, it’s not the best for grip due to the firmness of the polycarbonate used. These little grip patches counteract this. The front of the case extends up vertically beyond the front glass, allowing a very good lip for maximum lay on the table design. And since this lip doesn’t extend over the front glass in any way, I see no reason why any screen protector would have compatibility issues with the DualTek. Overall, I’m very impressed with the DualTek case. At its price point of $39.95 and your choice of colors, I have to give a strong recommendation to the PureGear DualTek if you’re looking for a very rugged case without transforming your iPhone into a rubber brick like most do.